Another 24 Hours of LeMons BS Inspection in the books, and we didn't hand out quite as many penalty laps as usual. Part of it was our unwillingness to grovel in the mud to examine cheaty suspension parts, of course. 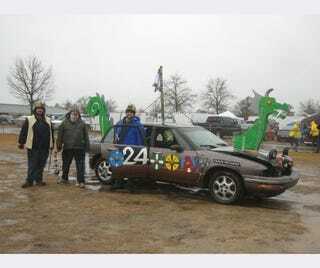 Another reason is that many cars that appeared to be machined out of pure Cheatonium-239 at the last race proved to be miserably slow when they hit the real-world race track. We're generally willing to cut some more slack for such a car the second time around.